The saga started in Rise of the Planet of the Apes comes to an end in Matt Reeves’ War for the Planet of the Apes. I’ve been a huge fan of these films since the first one. Taking a well known concept like Planet of the Apes and turning it on its head to focus on the Ape side of the story rather than the human was an interesting idea and it has mostly been mined to its full potential. The previous film, Dawn of the Planet of the Apes explored a world where Apes and Humans had been separated into factions with a large chunk of the human race wiped out by the Simian flu. This film continues that trend with a very clear divide between Apes and Humans caused by the War that started at the end of the last film and gives this one its title. This film isn’t about the humans at all and focuses on the leader of the Apes, Caesar (Andy Serkis). A lot of time is spent showing the audience the life he leads and the Ape society that has developed. It is established as peaceful and thriving which makes it more tragic when this society is threatened. Most of the story is from the perspective of Caesar. It’s less of a coherent narrative and more of a collection of loosely connected experiences that Caesar has. This isn’t a bad thing as it allows for a lot of variety but it can also feel weirdly disjointed at times with transitions that can be jarring. One minute the film is a personal story about a leader trying his best to protect his people and the next it becomes Schindler’s List with Apes. The disconnect can be felt though it all works as part of Caesar’s journey. Much of it is told through visuals rather than dialogue which makes for a welcome change as it means a minimum of exposition and allows for a story that feels intelligently constructed. The fact that an entire franchise can be built around a CGI character interacting with live action elements and make the emotional connection feel authentic is an astonishing feat in itself but the film doesn’t stop there. Caesar is a complex and flawed character played to perfection by Andy Serkis who delivers a layered performance. Caesar’s soft spoken nature and general decency is a big part of who he is and so much of his character is delivered through his body language. A clear sense of who Caesar is and what he stands for is delivered through very little dialogue and believable physicality. 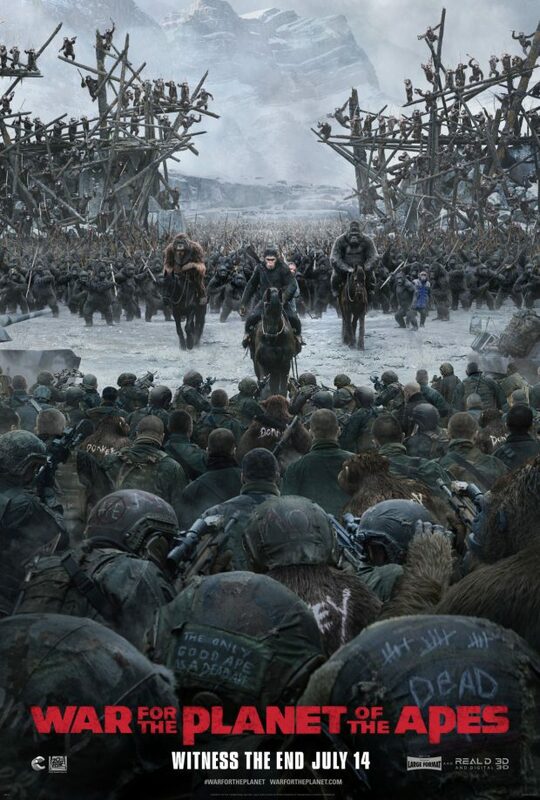 Despite the fact that Serkis is achieving this through motion capture while trying to emulate the movements of an Ape this comes through very clearly and it’s a remarkable performance when you really consider what went into it. It really helps that this film is visually stunning. The motion capture work and CGI blends in seamlessly with the live action elements and the animation is positively stunning. it’s really difficult to tell the real from the fake other than the the fact that the Apes do things that Apes can’t really do. That doesn’t diminish the excellent work done by really talented digital artists though and it almost had me fooled repeatedly. I’ve already mentioned the slightly disjointed story but it does work because of the characterisation. There’s a good mix between grounded emotional moments, thoughtful social commentary and comedy which comes mostly from Bad Ape (Steve Zahn). The film does fall apart slightly in its portrayal of the main antagonist known only as the Colonel (Woody Harrelson). His motivations are actually very clear and make a lot of sense but the character is written to be almost cartoonishly evil. Woody Harrelson is great in this role but the character could have been so much better had he been more sympathetic. It would have created a more interesting antagonistic relationship as Caesar and the Colonel could have essentially been opposites of one another. The film is also really overt with its references to other movies. Apocalypse Now is referenced in a really ham fisted way and the human soldier faction as a Nazi analogue is far too on the nose. There are definitely more subtle ways to get the point across. It also feels a little on the long side with infrequent action that isn’t all that impressive to watch. It does excel in other areas as I’ve already mentioned. Many of the individual sequences are really well put together such as the mechanics of the escape from the Ape concentration camp. There is a lot of creativity in how the Apes plan a way out of their predicament and it draws on what we know of the characters to make this work. Despite the flaws this is a really well put together film. The emotional beats land almost without exception, the characterisation of Caesar is really impressive and Bad Ape (Steve Zahn) offers some well placed comic relief while still being important to the story. The escape portion of the film is a lot of fun and shows some creativity in the execution though Woody Harrelson’s the Colonel being portrayed as cartoonishly evil despite having clear and relatable motivations feels like a missed opportunity. Andy Serkis does a really great job throughout building Caesar through soft vocals and body language. It’s an incredible performance and deserves to be recognised as such.